This is page FOUR of a four page part i did along with Udon for Enterbrain in Japan. 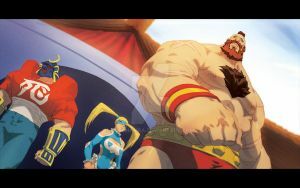 The book this appears in is for sale in Japan right now :Street Fighter Art Comic Anthology and there hopefully is a good chance we will release this in North America as well. It is over 150 pages of colour work by all sorts of japanese manga artists. Page 4, final page i i did up for my section. had a total blast with these, especially coz I got to draw Charlie and Alpha style Ryu. Done up around January of this year. Also I'm selling all these pages, if interested note me or sumfin. Mon personnage, Lady Rainbow est folle amoureuse de Charlie Nash. Hey you ever realized he looks like the floating head from Carmen Sandiego? no problem. if u want take a look at my artwork sometime. Ok. I'll go ahead and say it. The last panel of this page is the best SF illustration ever. your rendition of charlie is sick! I've never been a fan of SF comic,but this make me want to read it! came out real alpha style, nuts! Ok , how much are we talking? I'd buy this off you if your still selling? If you can get it too UK??? i could probably send it. hotdamn! Your quality's better than a lot of anime they show on adultswim and such! definitely appreciate the compliment on the work! Awesome. Awesome. Awesome. Unleash that can o' whupass! woo! I am so behind the times. Aint Charlie the guy Guile tries to claim vengeance for? but why charlie and ryu? does the japanesse chose the character ? Aww crap, Ryu is about to get a face full of Sonic Boom, me thinks. Wonderful work bro. does he really need glasses for fighting? You really are a phenomenal artist, like, you have no idea how amazed I am right now. I mean, I've been watching you for three years now and each year you've gotten better and better and I think that it is ridiculous that so much talent is bottled up inside of one person. Please keep up the awesome, great work and although I'm not all that religious,God bless you man! Sorry for the long comment but it is long past due. nice pose !! >w< !!! I must keep it up ! My vision is 20/20, but I wear glasses like Charlie's.